Tench Class Submarine: Laid down, 8 February 1944, at Boston Navy Yard, Boston, MA. 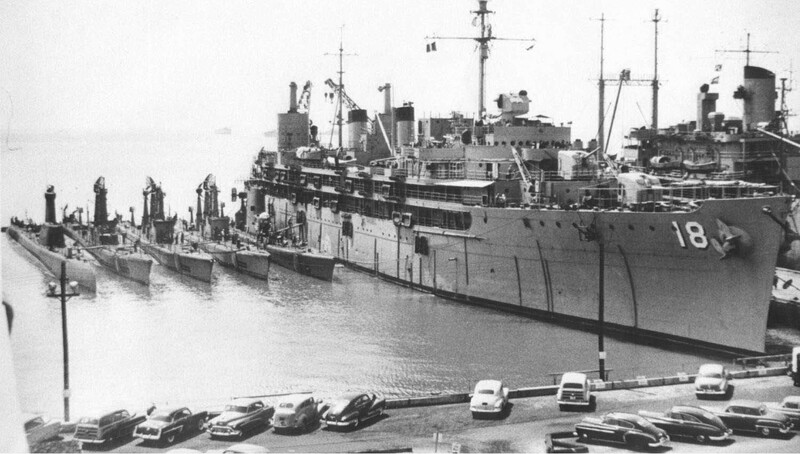 ; Launched on 15 December 1944; Commissioned USS Grampus (SS-523), 26 October 1949; Decommissioned, and simultaneously struck from the Naval Register, 13 May 1972; Transferred (sold) under the Security Assistance Program to Brazil; renamed Rio Grande Do Sul; Final Disposition, Sold 18 June 1981 to Verlome Shipyard, Angra Dos Reis, Brazil. Specifications: Displacement, Surfaced: 1,570 t., Submerged: 2,414 t.; Length 311' 8"; Beam 27' 4"; Draft 15' 3"; Speed, Surfaced 20.25 kts, Submerged 8.75 kts; Cruising Range, 11,000 miles surfaced at 10kts; Submerged Endurance, 48 hours at 2kts; Operating Depth, 400 ft; Complement 7 Officers, 69 Enlisted; Armament, ten 21" torpedo tubes, six forward, four aft, 24 torpedoes, one 5"/25 deck gun, two single 20mm guns; two /30 cal. 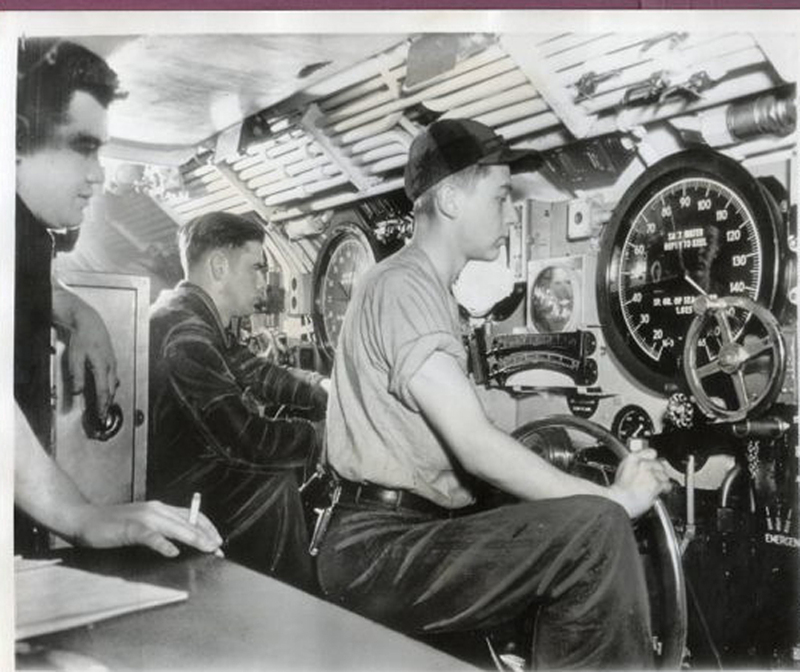 machine guns; Patrol Endurance 75 days; Propulsion, diesel-electric reduction gear with four main generator motors, Fairbanks-Morse diesel engines, UP 5,400. Fuel Capacity, 113,510 gal., Elliot electric motors, HP 2,740, two 126-cell main storage batteries, two propellers. 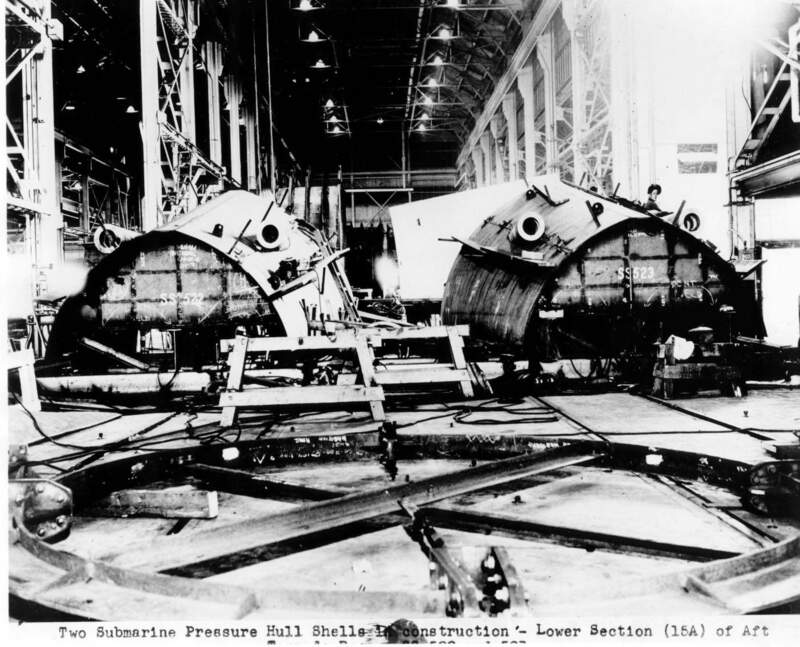 214k Sections of the pressure hulls of Amberjack (SS-522) and Grampus (SS-523) under construction in the Structural Shop of the Boston Navy Yard ca. 1944. Note: The original print is a Navy copy print which did not include the bottom line of the caption. USN photo from the National Park Service, Boston National Historical Park, cat. no. BOSTS-10259, courtesy of Stephen P. Carlson, Preservation Specialist, Boston NHP,Charlestown Navy Yard. 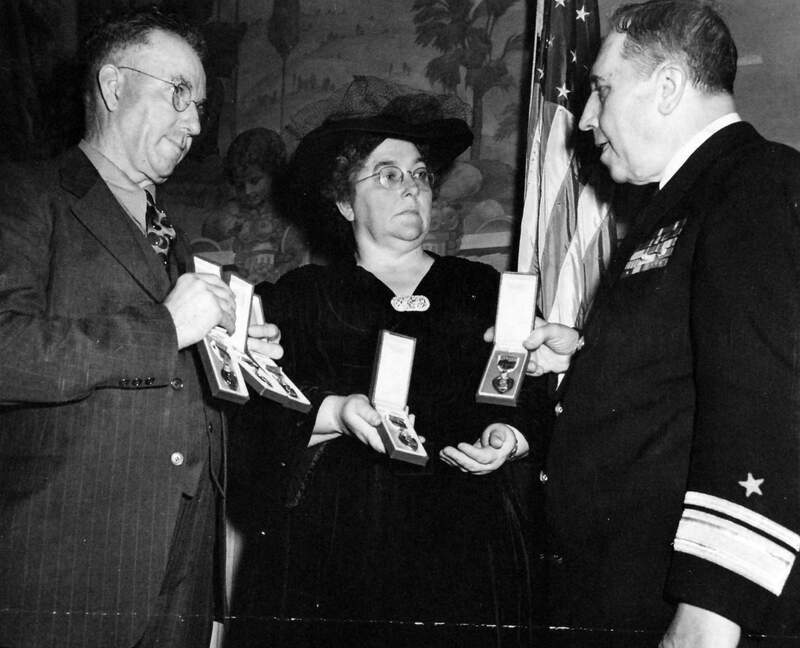 523k Rear Admiral Clark H. Woodward, USN, Chief of Industrial Incentive Division, Navy Department, praised the fortitude of Mr. and Mrs. Thomas F. Sullivan for keeping their chins up in the loss of their five sons, as he presented five posthumously-awarded Purple Hearts Medals at a ceremony in Washington. Their five Navy sons went down with Juneau (CL-52). Rear Admiral Woodward commended the parents for inspiration to workers resulting from their visit to more than 200 manufacturing plants and shipyards, 24 January 1944. 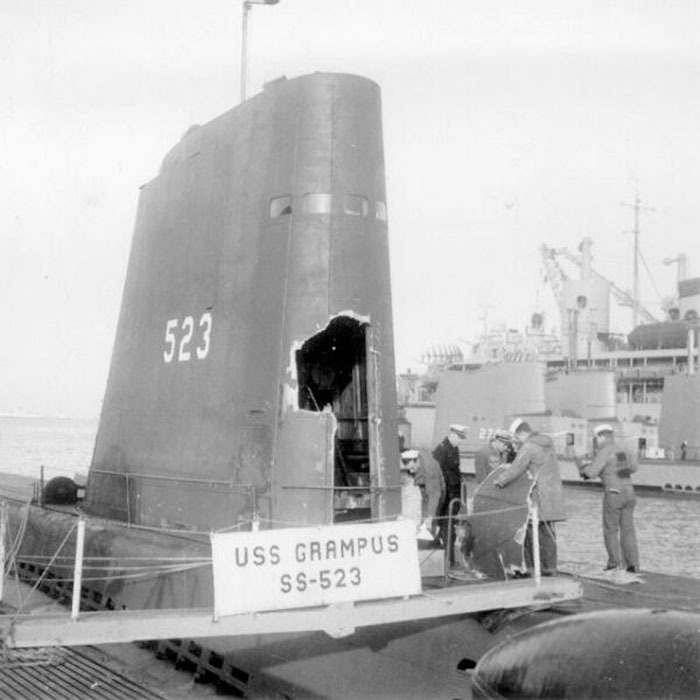 Both Grampus (SS-207) & Grampus (SS-523) were sponsored by his wife. (Someone please find a photo of her!) USN photo # 80-G-44491 courtesy of the National Museum of the U.S. Navy via flickr.com. 166k Grampus (SS-523) commissioning, Pier 8, Boston Naval Shipyard, 26 October 1949. USN photo from the National Park Service, Boston National Historical Park, Cat. No. BOSTS-11270, courtesy of Stephen P. Carlson, Preservation Specialist, Boston NHP, Charlestown Navy Yard. 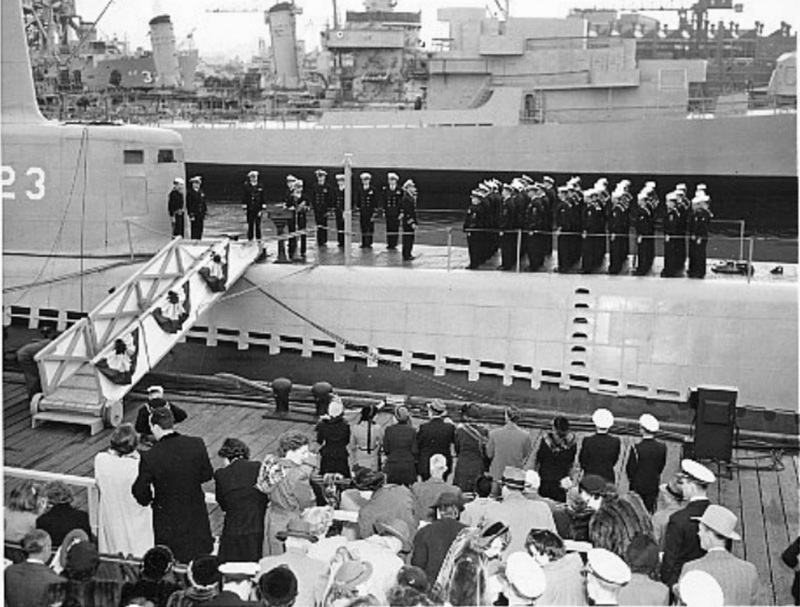 525k Commissioning of the Grampus (SS-523), 26 October 1949 at the Boston Navy Yard. A.P. Wirephoto by Paul A. Queenan courtesy of Tommy Trampp. 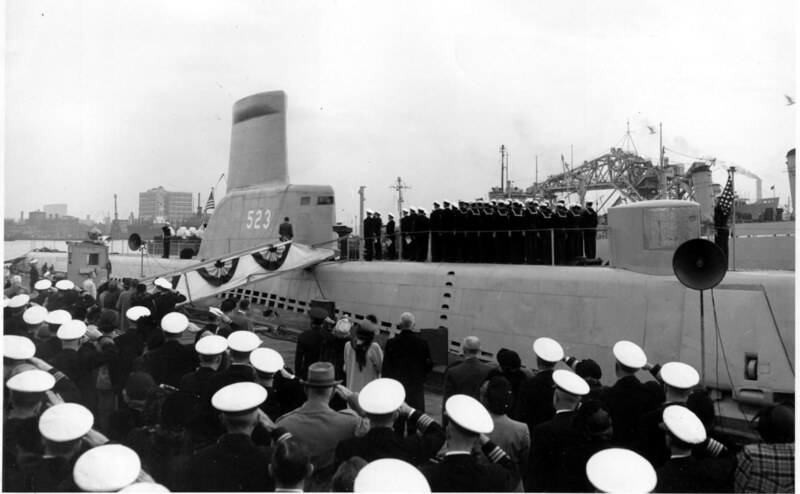 293k Commissioning of the Grampus (SS-523), 26 October 1949 at the Boston Navy Yard. Photo courtesy of ussgrampus.com. 222k Broadside view of a cutout of a GUPPY design. Photo courtesy of ussgrampus.com. 182k Overhead view of a cutout of a GUPPY design. Photo courtesy of ussgrampus.com. 375k KEEPING SUB ON EVEN KEEL WHILE SUBMERGED (21 March 1951). A.P. Wirephoto courtesy of John Hummel, USN (Retired). 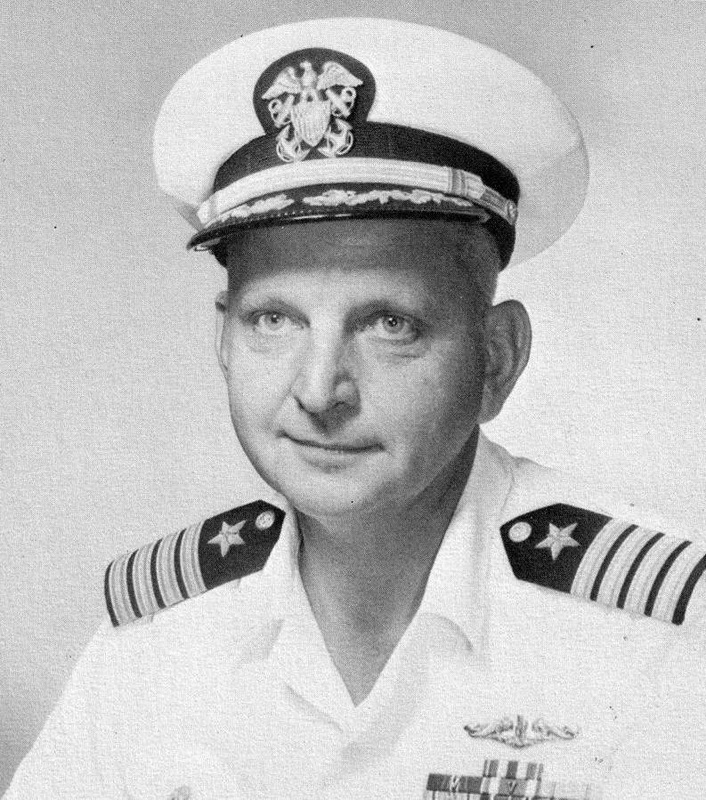 76k LCDR Eugene Columbus Barnhardt III was the Commanding Officer of the Grampus (SS-523) from October 1951 to January of 1954. Photo courtesy of the National Historical Center via Bill Gonyo. 88k Portside view of the Grampus (SS-523) underway, 27 May 1953. USNI / USN Photo. 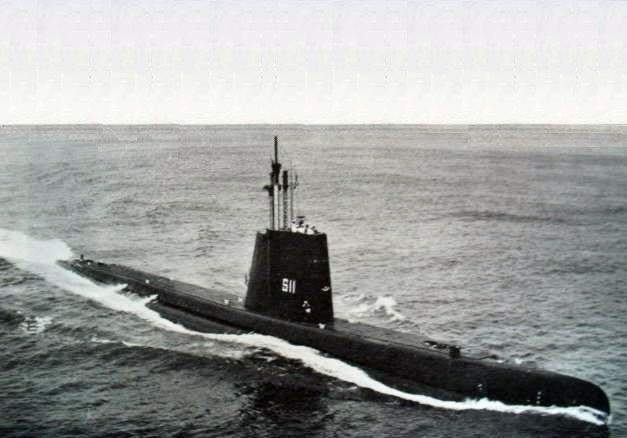 112k Grampus (SS-523), underway, circa 1950's. Courtesy of George M. Arnold. 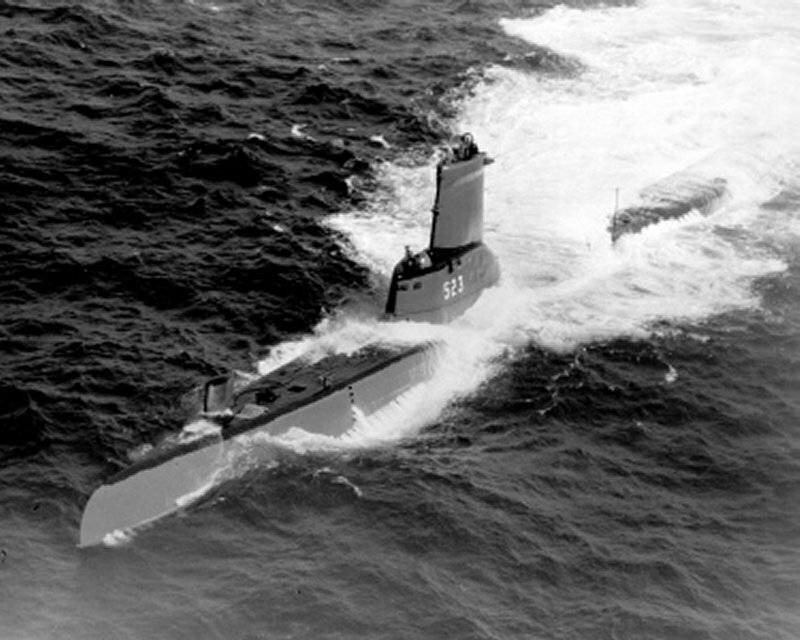 300k Grampus (SS-523), underway, circa 1950's. USN photograph courtesy of Scott Koen & ussnewyork.com. 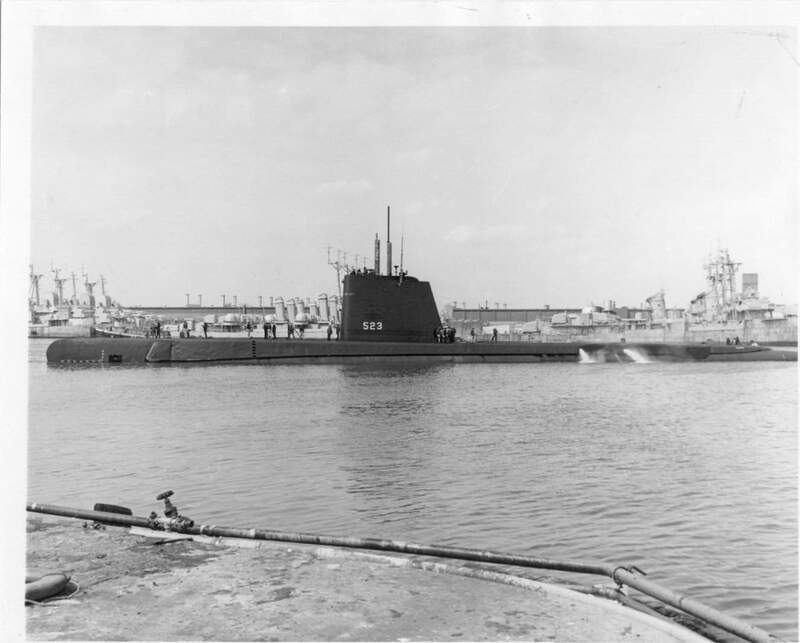 139k Redfin (SS-272) with the Grampus (SS-523) and other subs alongside AS-18 Orion was taken between 1953-55. The "Nodding idiot" on Redfin was converted to the electronic version in 1956. The other 3 boats are from outboard in Migraine II Requin (SS-481) and Migraine I Burrfish (SS-312) and Tigrone (SS-419). The order of the last 2 might be reversed. Text contributed by Larry Derouin. Photographed and contributed by John Hummel, USN (Retired). 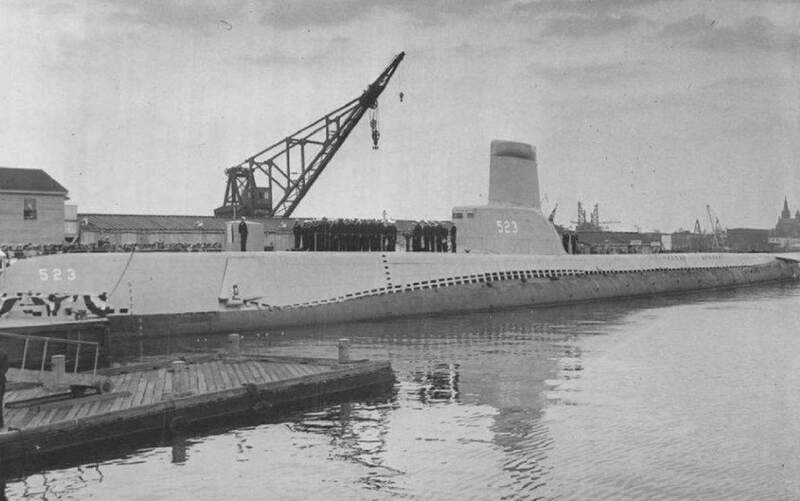 88k Grampus (SS-523), coming into the Philadelphia Navy Yard for overhaul, circa early 1960. Courtesy of John Hummel, USN (Retired). 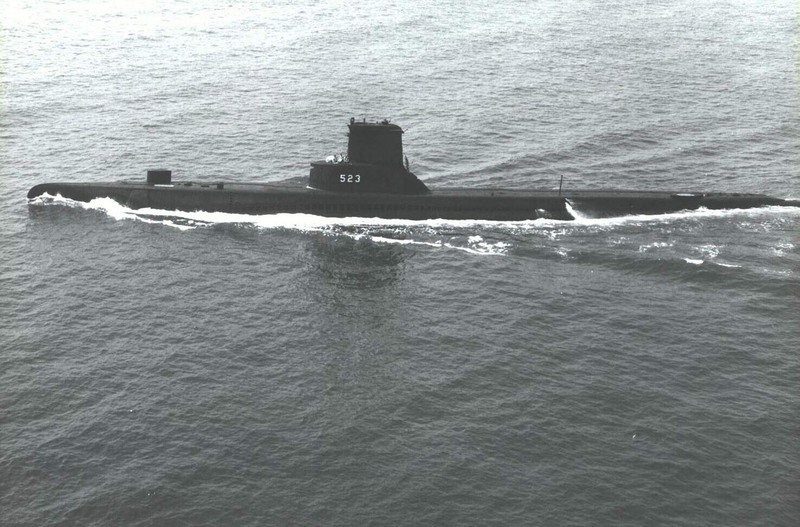 887k Grampus (SS-523) as seen from the Orion (AS-18)), circa 1960-61. Official USN photo courtesy of John Crawley. 83k Grampus (SS-523) with a fiberglass deficiency at D&S Piers in Norfolk for overhaul, circa mid 1960's. The Redfin (SS-272) is behind her. Orion (AS-18) is in the background with other subs from Subron 6. Courtesy of John Hummel, USN (Retired). 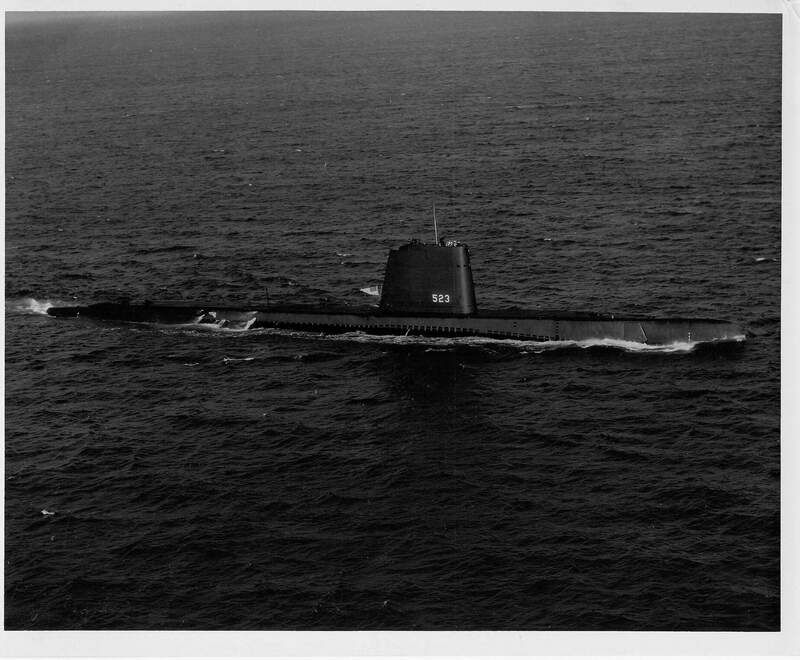 758k Eight page PDF Welcome Aboard the Grampus (SS-523), circa mid 1960's. USN photo courtesy of Scott Koen & ussnewyork.com. 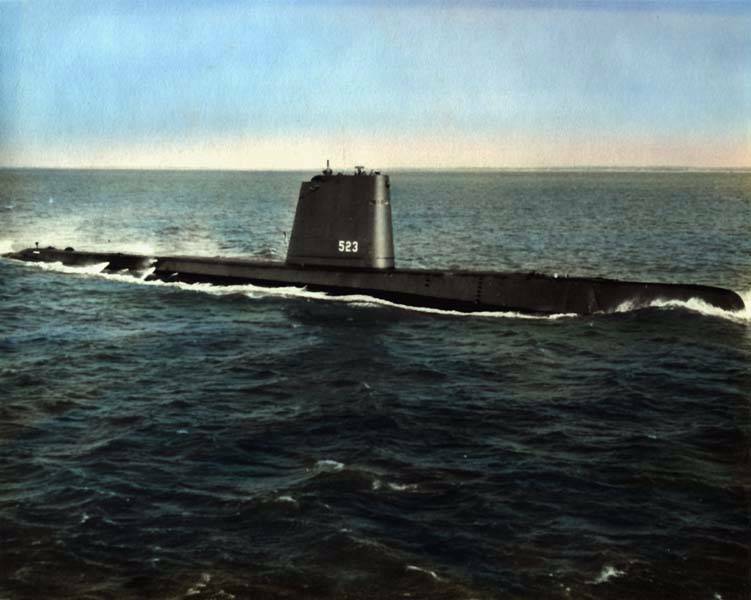 46k Starboard side view of the Grampus (SS-523), underway, circa mid-late 1960's. Courtesy of Ron Duffy, IC2(SS), Grampus (SS-523) 1966-68. 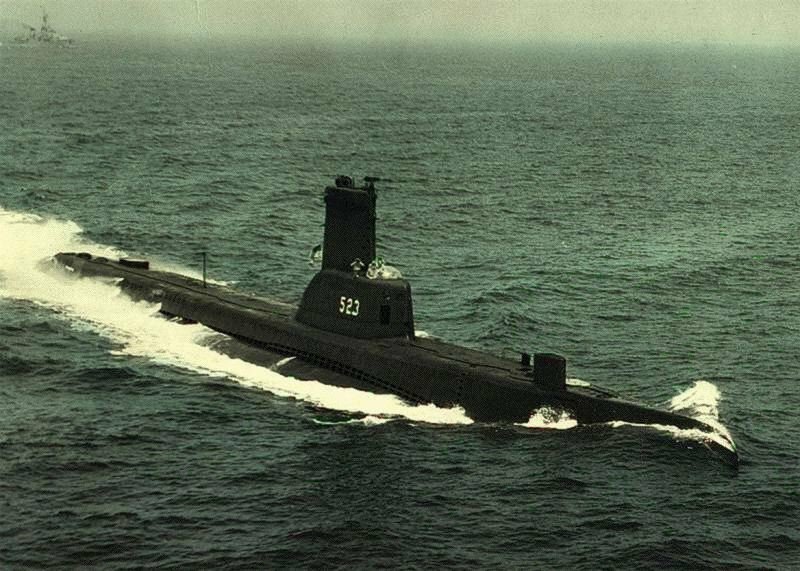 314k Port side view of the Grampus (SS-523), underway, circa mid-late 1960's. 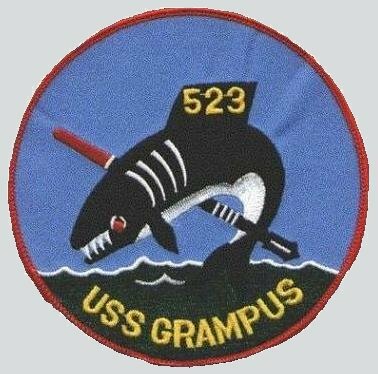 Courtesy of Ron Duffy, IC2(SS), Grampus (SS-523) 1966-68. 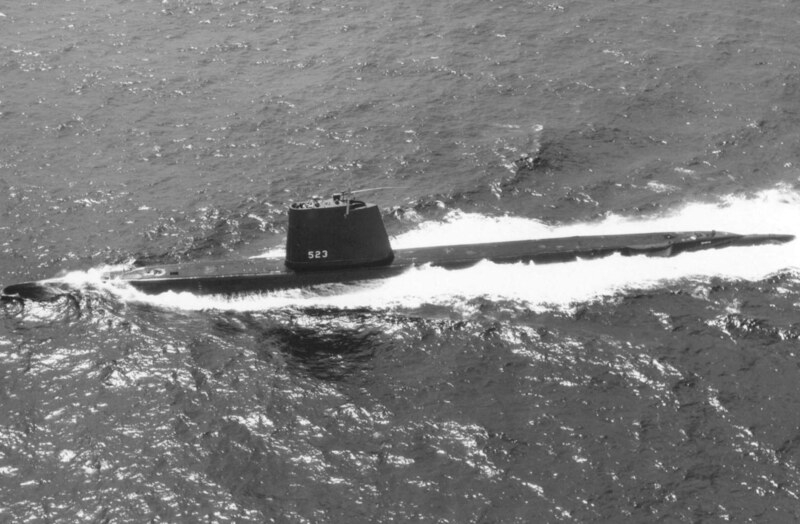 76k Starboard side view of the Grampus (SS-523), underway, circa mid-late 1960's. Notice a large dent in the superstructure aft of the engine outboards. That was caused by a practice ASROC missile that was supposed to go under us - but didn't! Photo & text courtesy of Ron Duffy, IC2(SS), Grampus (SS-523) 1966-68. 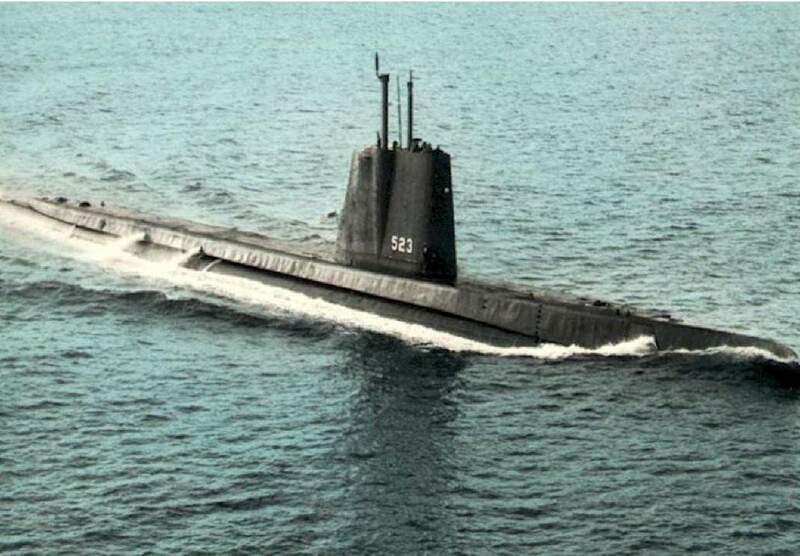 33k ex-Grampus (SS-523) as the Rio Grande Do Sul (S-11), underway probably off the coast of Brazil. Brazilian Navy photo by SRPM, via Jos� Henrique Mendes, courtesy of naviosdeguerrabrasileiros.hpg.ig.com.br, & submitted by Valdo Novaes. 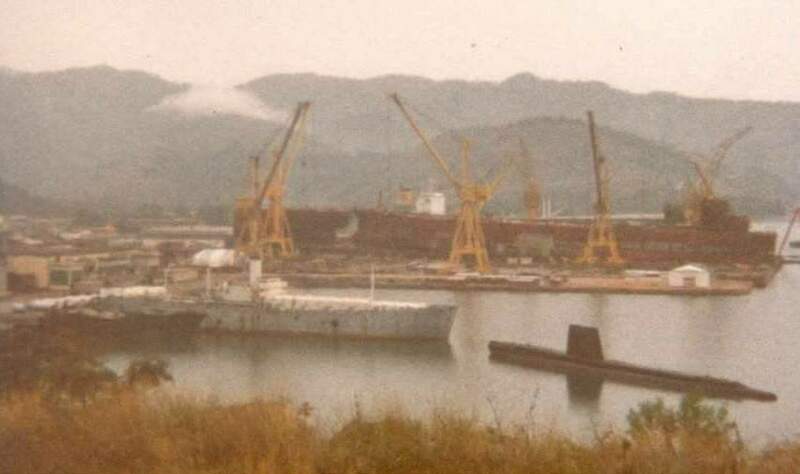 34k ex-Grampus (SS-523) as the Rio Grande Do Sul (S-11), awaiting to be scrapped by Verolme Estaleiro, 18 June 1981. Brazilian Navy photo by Renato Gaschler via naviosdeguerrabrasileiros.hpg.ig.com.br, & submitted by Valdo Novaes.